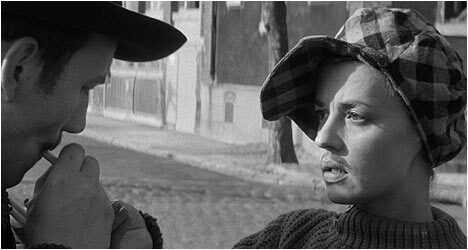 Based on the novel by Henri-Pierre Roche, Jules and Jim (1962) is one of the most famous love triangles ever put on film. Film critic Francois Truffaut read the book in 1955 and wanted to make it into a film. The story stayed with him and once he became a movie director and had a made a few films, he decided to adapt Roche’s book. The result is a French New Wave classic and a poetic, touching look at the intimate relationship between three people over several years. Aspiring writers Jules (Werner) and Jim (Serre) meet by chance and become fast friends. Jules is a shy Austrian and Jim is a slightly more outgoing Frenchman. They lead a romantic, bohemian lifestyle: smoking cigarettes in cafes, appreciating fine art and having flings with women. One day, they meet Catherine (Moreau) and their lives change forever. Jules becomes romantically involved with her even though Jim is also attracted to the woman. However, he doesn’t act on his feelings and Jules and Catherine get married, have a child and get a house together. They lead a seemingly idyllic existence but she is deeply unhappy. Catherine is unable to settle into routine domesticity because she is someone who refuses such social constraints. As she says at one point, “One can only truly love for a moment,” a controversial statement for its time as some charged that her character was without morals. Jeanne Moreau brings a playfulness to her role. For example, there is a scene where she dresses up like a man, draws a pencil-thin moustache on her face and starts smoking as whimsical music plays on the soundtrack. She even tries to fool passers-by on the street. It is one of the many times in Jules and Jim that Catherine dresses up as a man. She is an enigmatic character whom we never fully understand because we only see her through Jules and Jim’s eyes. Even they don’t understand her despite being seduced by her and living in closed quarters. Like many of the early French New Wave films, Jules and Jim has a youthful, go-for-broke energy in spirit and how it is filmed. There’s the iconic sequence of Catherine racing Jules and Jim across a bridge. The vitality and sheer exuberance of the moment is beautifully captured by Raoul Coutard’s shaky, hand-held camerawork. And nobody better represents this vitality than Catherine who is the epitome of a spontaneous free spirit. At one point, she even jumps in a river fully clothed on a whim. The Blu-Ray transfer is very solid with excellent contrast and good detail. It is worth upgrading from the DVD version. There are two audio commentaries, the first by co-screenwriter Jean Gruault, Truffaut collaborator Suzanne Schiffman, editor Claudine Bouche and film scholar Annette Insdorf. This track is largely anecdotal in nature with stories about making the movie and the fidelity of the adaptation from book to celluloid. In retrospect, Truffaut described Jules and Jim as a “naïve film,” but that is part of its charm. This is a solid track that mixes the aforementioned anecdotes with superb analysis. The second track features a conversation between actress Jeanne Moreau and Truffaut biographer Serge Toubiana. She talks briefly about how Louis Malle introduced her to Truffaut and early on she did a walk-on in The 400 Blows (1959). At that time, he told her about Jules and Jim and gave her the book to read. She describes the film as a well-crafted song in the sense that it flows with natural performances and an energetic camera. Moreau is well-spoken and talks fondly of the movie and her experiences working on it. “Truffaut on Roche” features the filmmaker talking about Roche. He describes the man as an art lover and not really a professional writer. He found Roche’s book in a second-hand shop and became fascinated by it, reading it many times. He began corresponding with Roche and got his blessing to make it into a film. “The Key to Jules and Jim” is a documentary that examines the real people that Roche based his novel on and that inspired him. The couple’s surviving relatives speak about their relationship to Roche and provide an interesting contrast to the film. “Truffaut on Truffaut” consists of five different interviews conducted with the man between 1965 and 1980. He talks about wanting to depict a credible relationship between a woman and two men. He also touches upon his love of literature and how being an only child influenced his work. In these interviews, Truffaut comes across as very intelligent, passionate and funny. There is an interview with the film’s cinematographer, Raoul Coutard. He remembers that, initially, the crew did not want to make the film, but after seeing the dailies they realized that Truffaut was onto something. He talks about the lighting techniques he used on the film and how he shot it in general. In addition to his presence on one of the commentary tracks, co-screenwriter Jean Gruault is interviewed. He gives his impressions of Truffaut and talks about adapting Roche’s books. Originally, the director wanted to modernize Jules and Jim, but Gruault convinced him to preserve the period in which it was set in. “Robert Stam and Dudley Andrew” is a conversation between these two film scholars. They talk about Truffaut’s film and point out that its dynamic opening credits shows what you can’t do in a book. It is almost a trailer for the film within the movie. These guys do a fine job of analyzing Truffaut’s film. Finally, there is a stills gallery of screenplay notes, script pages, some of Truffaut’s letters and shoot schedules that provide some insight into the director’s creative process and the development process of the film.